The Ancient Egyptian pyramids are some of the most impressive structures built by humans in ancient times. Many of the pyramids still survive today for us to see and explore. Why did they build the pyramids? 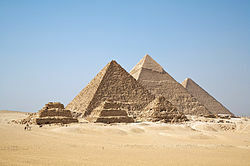 The pyramids were built as burial places and monuments to the Pharaohs. As part of their religion, the Egyptians believed that the Pharaoh needed certain things to succeed in the afterlife. Deep inside the pyramid the Pharaoh would be buried with all sorts of items and treasure that he may need to survive in the afterlife. Some of the earlier pyramids, called step pyramids, have large ledges every so often that look like giant steps. Archeologists think that the steps were built as stairways for the pharaoh to use to climb to the sun god. Later pyramids have more sloping and flat sides. These pyramids represent a mound that emerged at the beginning of time. The sun god stood on the mound and created the other gods and goddesses. How big were the pyramids? There are around 138 Egyptian pyramids. Some of them are huge. The largest is the Pyramid of Khufu, also called the Great Pyramid of Giza. When it was first built it was over 480 feet tall! It was the tallest man-made structure for over 3800 years and is one of the Seven Wonders of the World. 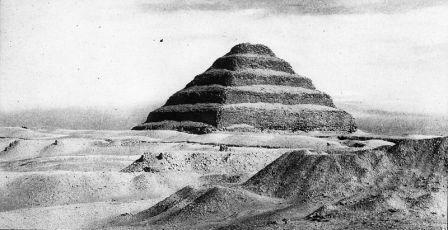 It's estimated that this pyramid was made from 2.3 million blocks of rock weighing 5.9 million tons. How did they build them? How the pyramids were built has been a mystery that archeologists have been trying to solve for many years. It is believed that thousands of slaves were used to cut up the large blocks and then slowly move them up the pyramid on ramps. The pyramid would get slowly built, one block at a time. Scientists estimate it took at least 20,000 workers over 23 years to build the Great Pyramid of Giza. Because it took so long to build them, Pharaohs generally started the construction of their pyramids as soon as they became ruler. Deep inside the pyramids lays the Pharaoh's burial chamber which would be filled with treasure and items for the Pharaoh to use in the afterlife. The walls were often covered with carvings and paintings. Near the Pharaoh's chamber would be other rooms where family members and servants were buried. There were often small rooms that acted as temples and larger rooms for storage. Narrow passageways led to outside. Sometimes fake burial chambers or passages would be used to try and trick grave robbers. Because there was such valuable treasure buried within the pyramid, grave robbers would try to break in and steal the treasure. Despite the Egyptian's efforts, nearly all of the pyramids were robbed of their treasures by 1000 B.C. The Great Pyramid of Giza points very precisely to the north. The pyramids of Egypt are all built to the west of the Nile River. This is because the western side was associated with the land of the dead. The base of a pyramid was always a perfect square. They were built mostly of limestone. There were traps and curses put on the tombs and the pyramids to try and keep robbers out.